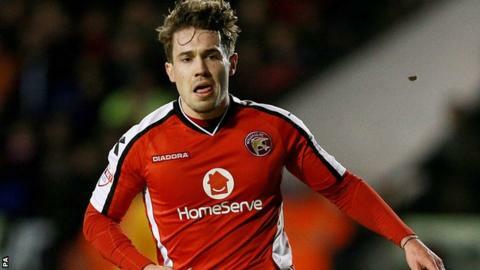 Tom Bradshaw's stunning brace helped Walsall claim a late victory over managerless Doncaster. The visitors nearly went ahead through James Coppinger's bicycle kick but Neil Etheridge moved well to make the save. Walsall improved after the break and were rewarded with five minutes to play through Bradshaw's spectacular volley. Bradshaw then chipped in a second over visiting keeper Thorsten Stuckmann in injury time to inflict a losing start on Rovers' caretaker manager Rob Jones. The result means Walsall have now won five of their seven games in League One, while Doncaster, who were playing for the first time since the sacking of Paul Dickov, remain winless away from home this season. "Last week it was frustrated at the result but pleased with the performance, this week it was pleased with the result but frustrated with the performance. "It was like a chess game, we changed system two or three times throughout the game. "People talk about playing in the hole, but you've got to have a hole to play in." Match ends, Walsall 2, Doncaster Rovers 0. Second Half ends, Walsall 2, Doncaster Rovers 0. Attempt missed. Cedric Evina (Doncaster Rovers) right footed shot from the centre of the box is too high. Goal! Walsall 2, Doncaster Rovers 0. Tom Bradshaw (Walsall) right footed shot from the right side of the box to the top left corner. Assisted by Sam Mantom. Paul Keegan (Doncaster Rovers) is shown the yellow card for a bad foul. Kieron Morris (Walsall) wins a free kick in the attacking half. Corner, Doncaster Rovers. Conceded by Neil Etheridge. Attempt saved. Aaron Taylor-Sinclair (Doncaster Rovers) right footed shot from outside the box is saved in the bottom right corner. Attempt missed. Tom Bradshaw (Walsall) right footed shot from the centre of the box misses to the right. Goal! Walsall 1, Doncaster Rovers 0. Tom Bradshaw (Walsall) right footed shot from the right side of the box to the top left corner. Substitution, Doncaster Rovers. Dany N'Guessan replaces Andy Williams. Delay in match James Coppinger (Doncaster Rovers) because of an injury. Curtis Main (Doncaster Rovers) wins a free kick in the attacking half. Foul by Adam Chambers (Walsall). Attempt blocked. Sam Mantom (Walsall) right footed shot from outside the box is blocked. Attempt missed. Paul Keegan (Doncaster Rovers) right footed shot from outside the box misses to the left. Attempt missed. Sam Mantom (Walsall) right footed shot from outside the box is too high. Mitchell Lund (Doncaster Rovers) is shown the yellow card for a bad foul. Jordan Cook (Walsall) wins a free kick in the defensive half. Foul by Mitchell Lund (Doncaster Rovers). Substitution, Walsall. Jordan Cook replaces Milan Lalkovic. Attempt blocked. Tom Bradshaw (Walsall) right footed shot from the left side of the box is blocked. Corner, Doncaster Rovers. Conceded by Andy Taylor. Substitution, Doncaster Rovers. Paul Keegan replaces Richard Chaplow. Substitution, Doncaster Rovers. Cedric Evina replaces Cameron Stewart. Foul by Paul Downing (Walsall). Substitution, Walsall. Kieron Morris replaces Rico Henry. Corner, Walsall. Conceded by Gary Mackenzie. Attempt missed. James O'Connor (Walsall) header from the centre of the box misses to the right. Corner, Walsall. Conceded by Thorsten Stuckmann. Attempt saved. Andy Taylor (Walsall) right footed shot from outside the box is saved in the bottom right corner. Attempt saved. Andy Williams (Doncaster Rovers) right footed shot from outside the box is saved in the top centre of the goal. Attempt missed. Milan Lalkovic (Walsall) left footed shot from the centre of the box misses to the left. Oscar Gobern (Doncaster Rovers) wins a free kick in the attacking half. Jason Demetriou (Walsall) wins a free kick in the attacking half.